The glass company grew even larger and more successful and eventually it became necessary to remove the schoolhouse to alleviate congestion around the factory. Factory Street (now called Dewey Avenue) was extended eastward to the area known as Sand Hill and, in 1851, a new, larger school was erected at 16 Dewey Avenue (at the corner of George’s Rock Road). 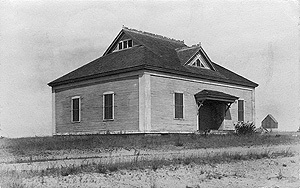 Known as the Jarvesville School or the Sand Hill School, the first building here collapsed while under repair and was replaced in 1885 with a new, more solid structure which still stands today. The 1885 Sand Hill School was built in the Carpenter Gothic style with decorative gable and main ridge molding and brackets over the entrance. There was a dividing wall down the middle and the building had two entrance doors (gender-separated entrances were the custom at the time). The two classrooms in the new school served the lower grades in that part of town. 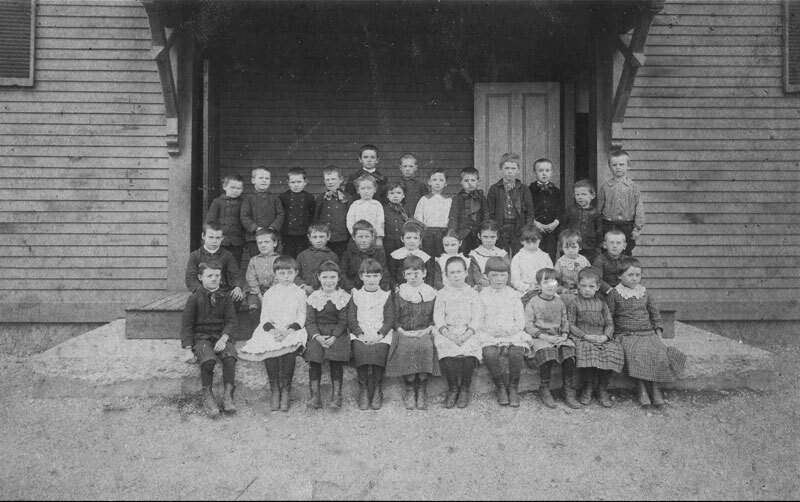 For some years prior to the construction of the Henry T. Wing School in 1926-7, the Sand Hill School held the 7th and 8th grades for the entire town. 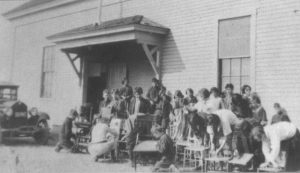 A group is learning chair caning in 1925 in front of the former Sand Hill School on Dewey Avenue. Over the years, windows were added and the front entrance was modified. 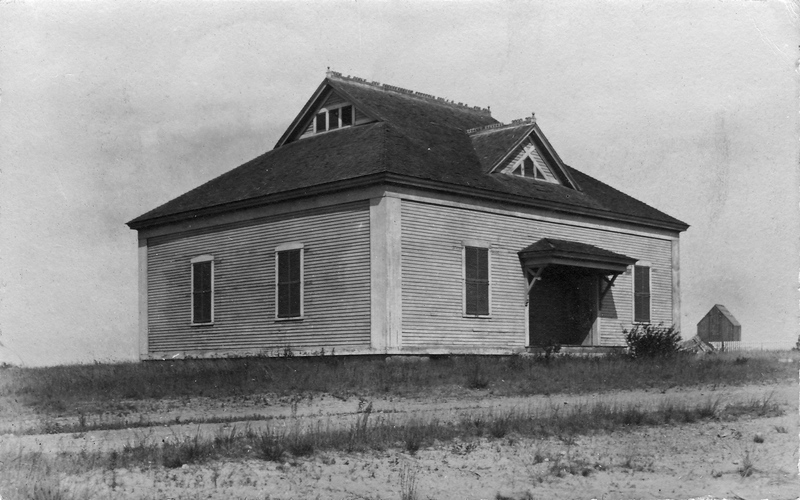 After the school was closed, the building served as a meeting hall for American Legion Post #188 (starting in 1931). In 1950, the structure was re-named the Clark-Haddad Memorial Building for the first two Sandwich residents who died during World War I: Alden Clark and Michael Haddad. The building was very heavily used by many groups from the early 60s through the 80s and as a gathering place for children and seniors. The American Legion moved to new quarters in 1972. 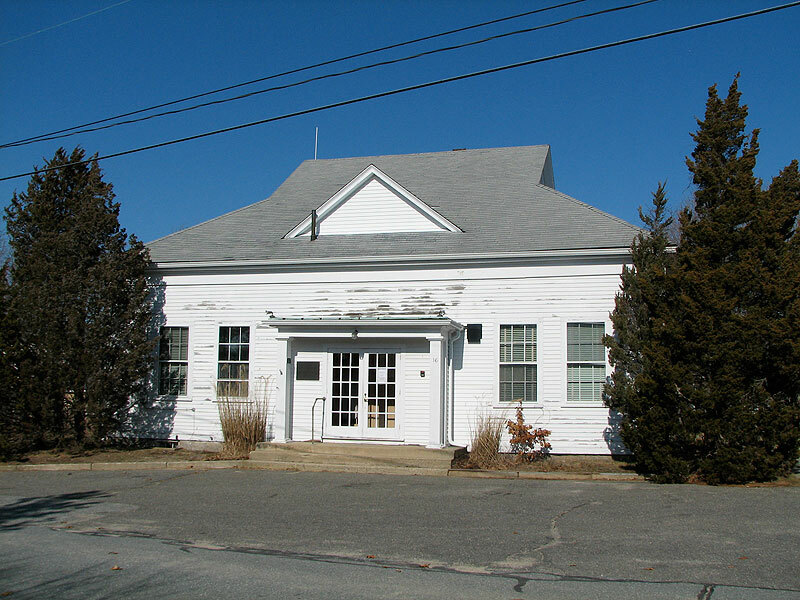 Later, the building was used as office space by the Sandwich Public Schools until 2007. Today the building stands vacant. Clark-Haddad Memorial Building ca.1970. Note additional windows and modified front entrance. The building is a wood-frame, cross-gabled, 5 bay by 4 bay, 1-story former school house with a high gable on hip roof and a central blind gable dormer. The face of the blind dormer originally had decorative molding in the Carpenter Gothic style. The building has a granite block foundation, wood clapboards on the front elevation, and shingles on the side elevations. The front elevation is articulated with wide cornerboards and fascia, square columns, centered over the projecting front entrance under a piered portico which occupies the central bay of the facade. Other elements include tall 6/6 sash windows, a molded roof cornice and plain frieze. Lovell, Russell. Sandwich. A Cape Cod Town. 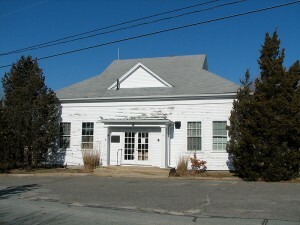 Town of Sandwich Archives and Historical Center. William S. Sullwold Publishing, Inc. Taunton, Mass. 1984. Within the last two or three months the idea of our town selling the Clark-Haddad Memorial building at 16 Dewey Ave. was being discussed by some town officials, and this has prompted me to do a little research on the building to better understand its role in town life. For close to 20 years it has been used for school administration, but prior to that use it served the community in many different ways dating back to its construction in 1885. I was also curious about how the name of the building came about. Haddad sounds Middle-Eastern, and as for Clark, my research on him yielded a surprise connection with my own family, which I will share shortly. To learn the history of the building I consulted Sandwich, a Cape Cod Town, by R.A. Lovell, Jr., our town archivist Barbara Gill, old annual town reports, and talked to a few people around town. The building was originally called the Jarvesville School, and was built on the site of an older school which had collapsed while under repair. The two classrooms in the new school served the lower grades in that part of town. For some years prior to the construction of the Henry T. Wing School in 1926-7, the Jarvesville School held the 7th and 8th grades for the entire town. By 1931 it was being leased to the Clark-Haddad Post of the American Legion, and in 1935 the town voted to establish the building as a permanent war memorial. The American Legion continued its use until their current facility was set up in the late 1960s. 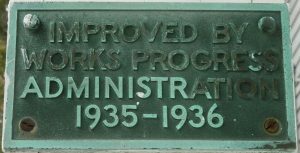 In 1950 the building was officially dedicated as the Clark-Haddad Memorial Building, and from then until 1986, the facility was administered by a group of elected trustees. It appears that throughout the time of American Legion use, other groups met there as well. A study of Town of Sandwich Annual Reports indicates that the building was very heavily used by many groups from the early 60s through the 80s, or until the use changed to school administration. The list of users through these years provides a good look at community activity in Sandwich. In addition to the American Legion there was a private and later a town-run kindergarten, the Women’s Auxiliary, the Sandwich Women’s Club, the Junior Women’s Club, the Blue Birds, the Faith Baptist Church, Well-Child Clinics, Camp Fire Girls, Sandwich Home Extension Group, Sandwich J.C., the Arts and Crafts Society, Sandwich Gardeners, Boy Scouts – Troop 47, and “supervised parties and dances” – the list goes on and on. The building became home to the Sandwich Council on Aging and their many activities ranging from meals to card games. The main point to recognize here is the importance of public meeting halls, not only to serve each specific need, but to build an overall sense of community. We cannot get enough of that. Should the current use of this building cease, let’s keep it in public use. Now to one of my original questions, who were Clark and Haddad? Alden Clark and Michael Haddad were the first Sandwich residents to perish during the First World War, though it appears they never made it to the fighting. They both died in February 1918 in this country from illness, shortly after they had enlisted. Michael Haddad was born in Syria about 1892, and came to this country with his father George, who came to Sandwich “to work at the glass factory”, as his obituary states. Since the Boston and Sandwich Glass Co. had closed in 1888, perhaps he worked at one of the smaller, later glass oriented businesses, of which there were several. Michael lived for nine years with the family of George T. McLaughlin, a very active businessman in town who also served as selectman and led the town band. Michael was said to be very well liked, and “held in high esteem”. Alden Clark was the youngest child of Robert and Emma Clark who lived at #7 Liberty Street. I haven’t learned what Robert’s profession was, but I have found several references to Alden. He is mentioned, for example, in the 1913 Town Report as one of the workers in the Town Cemetery, and this would likely involve mowing. Of more interest, however, is what I found in the photo album and papers of my grandmother Anna Nye Armstrong (1893-1930), who married Samuel D. White in 1917. I have studied her photo album for years, and was familiar with a picture of her at her home, Mill Pond Farm (108 Old County Road) sitting on the back of an early motorcycle, with a good-looking guy at the controls. When I asked my mother about this, she thought it might have been Alden Clark, who was boyfriend at that time – she didn’t know any more than this. Earlier this year, my mother showed me another scrapbook of Anna’s that I had never seen. In this was a collection of her classmate’s photos, labeled, including Alden Clark. He was obviously the motorcyclist, though the photos were taken a few years apart. In that portion of her album with graduation photos, there is one of her holding a SHS (Sandwich High School) banner with Alden, also taken at Mill Pond Farm, so clearly they were friends. To top it all off, her scrapbook also contained a handwritten copy of the Class of 1913 History and Prophecy written by Francis Joseph Buckley, in which all the classmates are mentioned in different ways – there were only seven in all! By the way, the high school was then located on Academy Lane, off of Grove Street overlooking the Town Hall. The history tells of numerous group projects, carried out in part to raise money for the upcoming class trip to Washington, D.C., which was taken in May, 1913. The prophecy was quite imaginative, taking place years later in a sort of dream state. My grandmother was the president of a university, and Alden had become a renowned baseball player. There lives were to be much shorter than predicted, unfortunately, in both cases due to illness, but it appears that their school days were lively and cheerful. Back to the old Clark-Haddad Memorial Building – I have one more connection there, my only one, actually. Forty long years ago I played in a little band, “The Minus-Four”, at one of those supervised dances mentioned in the town reports, my first real gig as a musician. I hope this great old building continues to be appreciated. This is an attempt to clarify the historical facts and provide clarity to a myth, which has been perpetuated by some for many years in Sandwich. It is not my intention to disrespect two men who served their country in the military, one as a natural-born citizen and the other as a naturalized citizen, during World War I.
I am referring to Alden Clark of Sandwich, who enlisted in the Army on Sept. 20, 1917, and was assigned to Camp Devens to undergo basic training. I am also referring to Michael Haddad of Boston, an immigrant from Beyreuth, Syria, who was one of 29 Syrians in Massachusetts that enlisted in the war efforts. According to records, Mr. Haddad, at a younger age, lived with George T. McLaughlin and his family in Sandwich. For many years, it has been reported that both men were killed in the war in February 1918. 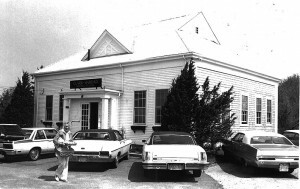 As a result, a historic building in Sandwich, built in 1885 as a schoolhouse for glass factory workers, was renamed the Clark-Haddad Memorial Building in 1950. The town is now trying to restore the building on Dewey Avenue. It is clear from their death certificates that both men died from diseases while undergoing training here in Massachusetts. Mr. Clark was part of Company H, 302nd Infantry, 76th Division. The 302nd infantry was a part of the fire, truck and hose companies. While undergoing training at Camp Devens, he was promoted to corporal on Jan. 16, 1918. Shortly thereafter, he contracted “septicemia” and died on Feb. 24, 1918. Mr. Clark is buried in the family lot in the Bay View Cemetery in Sandwich. The Gold Star records of Massachusetts state that an American Legion post was named after him. Mr. Haddad enlisted in the Navy on Dec. 7, 1917, in Boston and was in training at the U.S. Naval Training Camp on Bumkin Island in Boston Harbor. He was part of the United States Naval Reserve. Records indicate that he died from pleurisy 47 days after beginning training. His next of kin was listed as Mary McLaughlin, who was living at Mr. Haddad’s address in Roxbury during that time. At the time of his death, Mr. Haddad was listed as being from Boston and working at Padden Motor Co. in Dorchester. However, his body was brought back to Sandwich for burial. Mr. Haddad is buried in the McLaughlin plot in Saint Peter’s Cemetery in Sandwich. It is noted that both men filled out their draft cards on the same date — June 5, 1917 — Mr. Clark in Barnstable and Mr. Haddad in Boston. Mr. Clark was 21 and Mr. Haddad was 26 at those signings. I hope this provides clarity to those who may think that they both were killed as a result of combat during World War I. It is important that history reflect the factual occurrences in the manner they happened. As a veteran, I paid my respects to both men for what they attempted to do in defending our country during World War I. Although they did not die in combat, it was the war, and their training for combat, that likely put them in a position of contracting the diseases. All of the documents uncovered for this research will be given to Barbara Gill, the Sandwich historian, with a copy to the Clark-Haddad American Legion Post. Special thanks go to the Town Clerk’s office in the towns of Sandwich, Hull and Chelsea, Sandwich Town Hall and Mrs. Gill for assisting in providing this information for historical clarity. Carl Johansen lives in Sandwich. This entry was posted in Architecture, Cemeteries, Glass Factory, Historic Buildings, Schools. Bookmark the permalink.